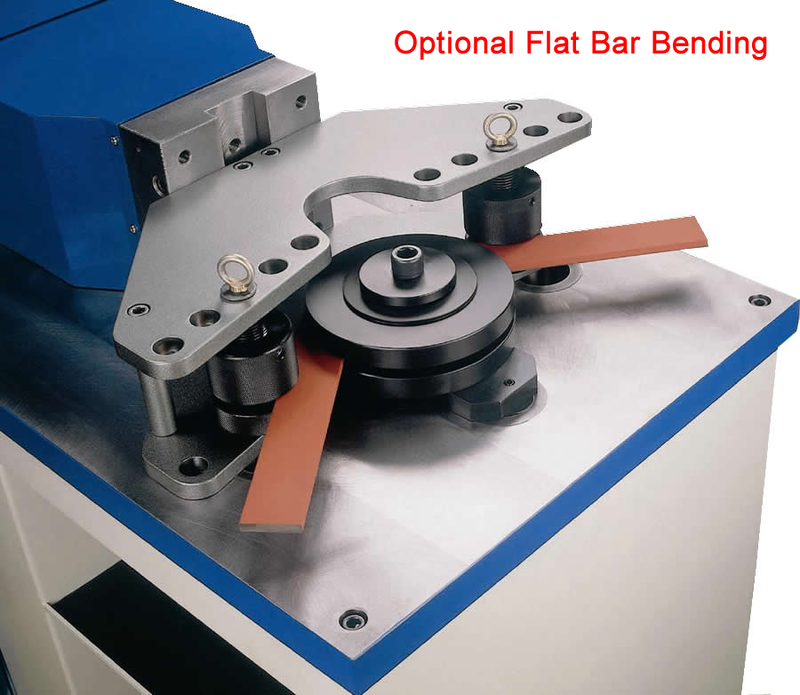 Model SB-8, Shear capacity 20ga, Bending capacity 20ga, 8" Bed width, Max bend angle 90°, Back gauge, Shipping Dim. 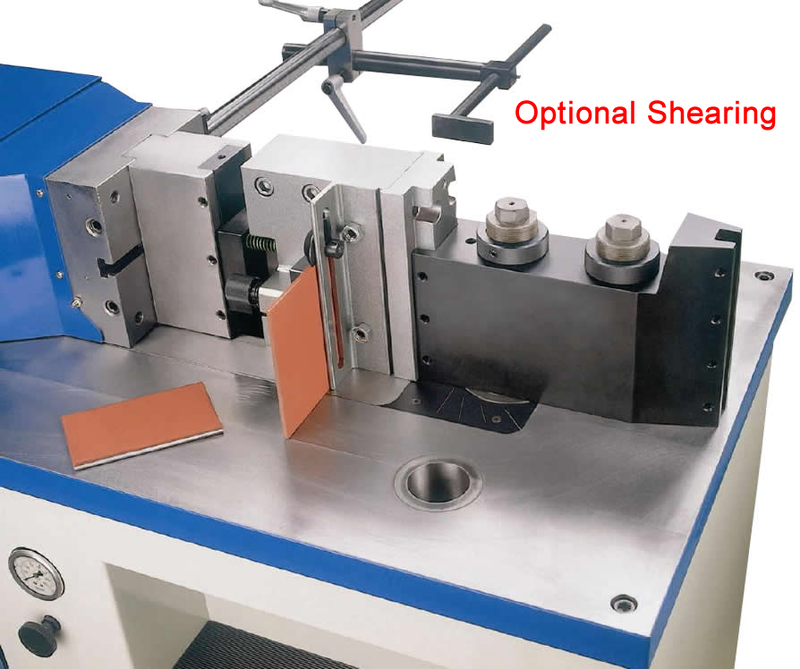 20" x 13" x 7", Shipping weight 27lbs. 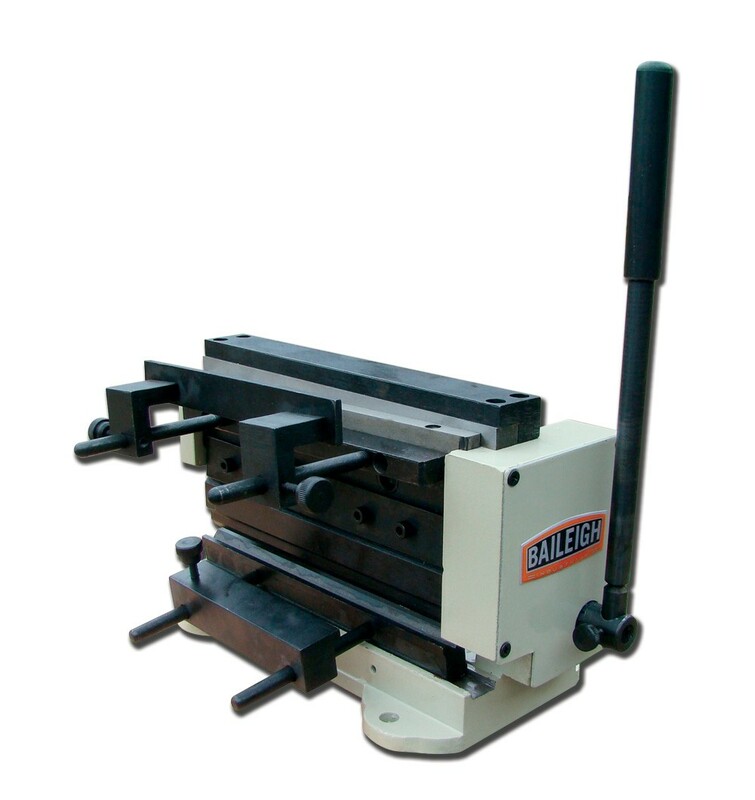 Model BP-3142NC, 1/4" Mild steel capacity, 31" Table length, 29" Between housings, Table to ram 7.75", 2" Stroke, Return speed 1.1"/sec, Approach speed 0.9"/sec, Bending speed 0.4"/sec, Back gauge length 19.5", DRO for back gauge and down position, Multi V bottom die, Universal tooling holder, Foot pedal operated, 2hp 110v 1ph, Shipping Dim. 48" x 48" x 72", Shipping weight 2,000 lbs. 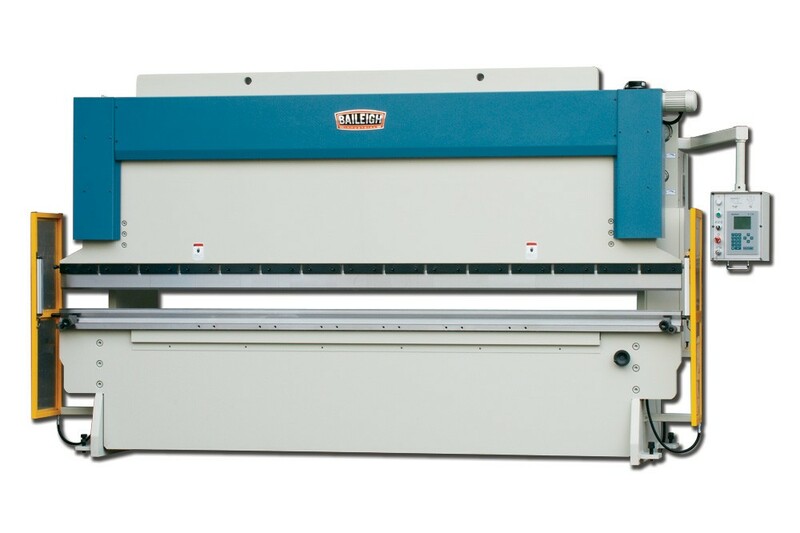 Model HPB-45NC, 45 Ton capacity, This machine can bend, punch & shear, NC controller can handle up to 99 programs, Foot pedal control, Table height 36.61", Stroke length 9.84", Punch height 7.875", Approach speed 1.5"/sec, Return speed .78"/sec, Working speed .51"/sec, Stroke accuracy +/- .002", Fixture holes: (1) @ 3.268" Dia. 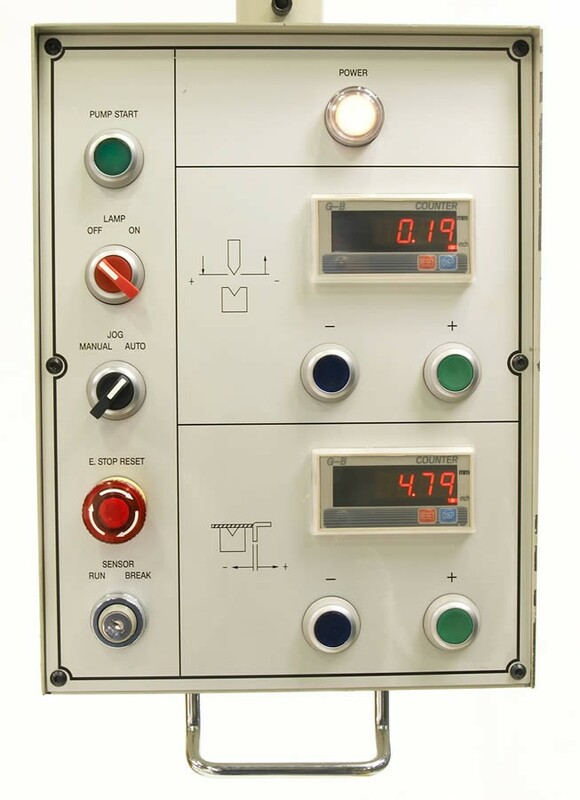 & (3) @ 2.283" Dia., 5hp 110v 1ph, Shipping Dim. 64" x 26" x 47", Shipping weight 2,266 lbs. 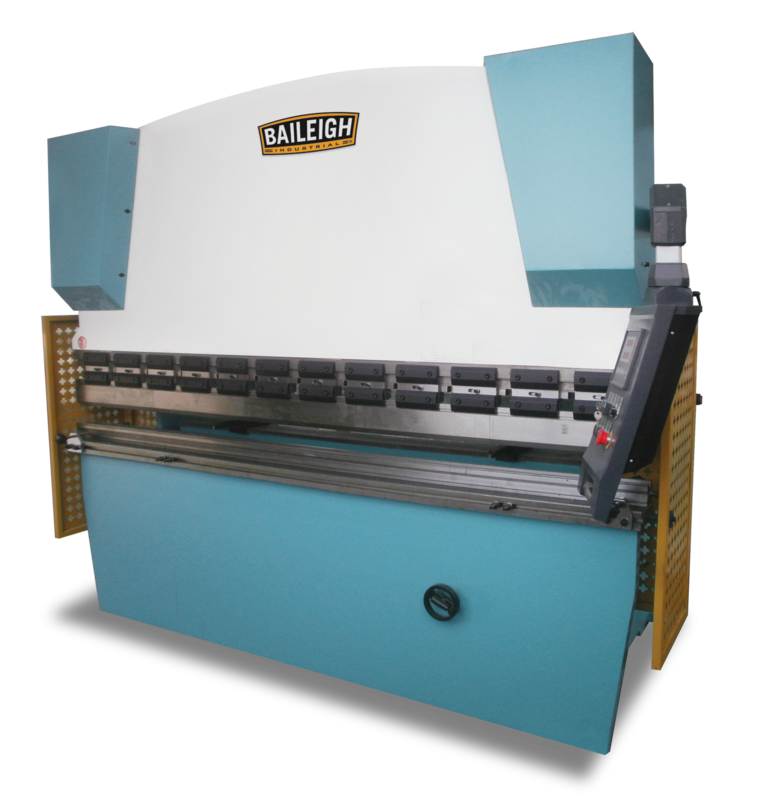 Model HPB-78NC, 78 Ton capacity, This machine can bend, punch & shear, NC controller can handle up to 99 programs with up to 10 bends each, Foot pedal control, Table height 37.4", Stroke length 13.78", Punch height 11.81", Approach speed 1.69"/sec, Return speed .55"/sec, Working speed .43"/sec, Stroke accuracy +/- .002", Fixture holes: (1) @ 4.646" Dia. 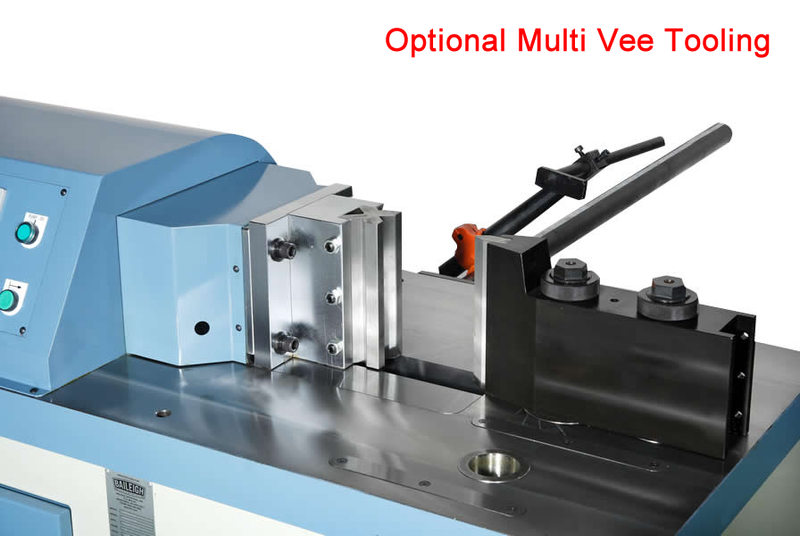 & (3) @ 3.268" Dia., 7.5hp 220v 3ph, Shipping Dim. 81" x 38" x 61", Shipping weight 4,580 lbs. 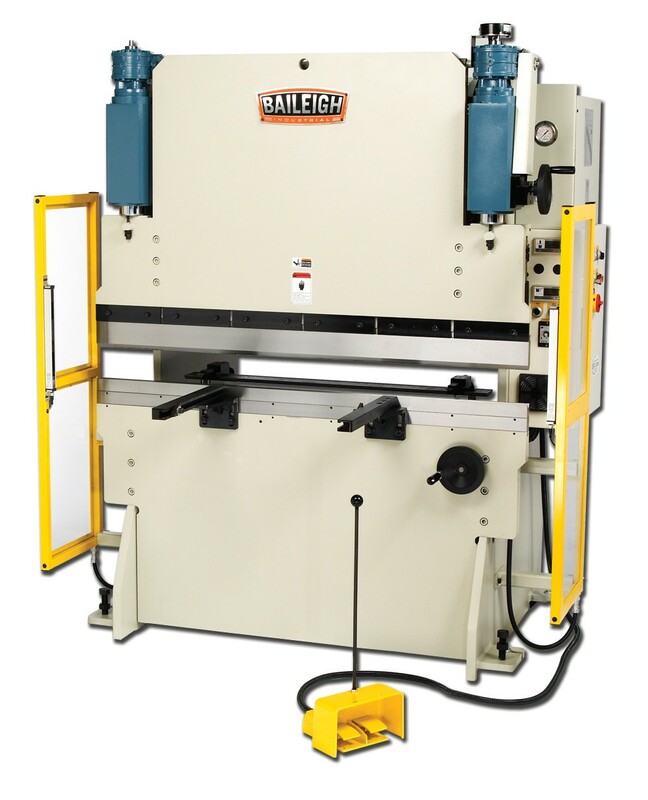 Model BP-3350NC, 33 Ton capacity, Max bending length 50", Max thickness .098", 38" Between housings, Adjustable stroke, 2 Axis NC controller, 3 Run modes: Jog/Manual/Auto, Foot pedal control, Motorized back gauge, DRO for downward stroke, DRO for back gauge, Safety guards with a 6 light safety curtain, Front material rests, 20gal Oil capacity, 220v 3ph, Shipping Dim. 55.5" x 47.5" x 80.75", Shipping weight 2,640 lbs. 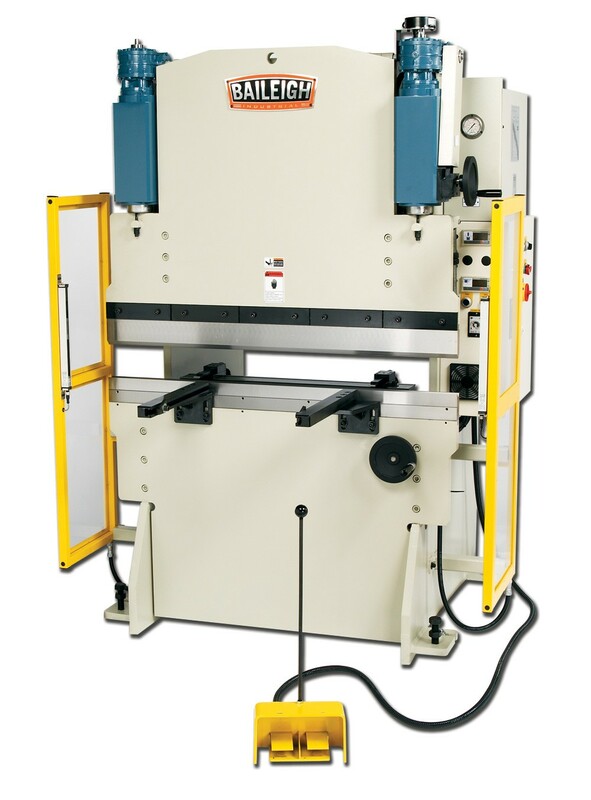 Model BP-3360NC, 33 Ton capacity, Max bending length 61", Max thickness .078", 49.21" Between housings, 9.84" From table to ram, Bending speed .275"/sec, Approach speed 3.14"/sec, Return speed 2.36"/sec, Adjustable stroke, 2 Axis NC controller, 3 Run modes: Jog/Manual/Auto, Foot pedal control, 1/2hp Motorized back gauge, Gauge length 23.62", DRO for downward stroke, DRO for back gauge, Safety guards with a 6 light safety curtain, Front material rests, 24gal Oil capacity, 3hp 220v 3ph, Shipping Dim. 67" x 47.5" x 80.75", Shipping weight 3,300 lbs. 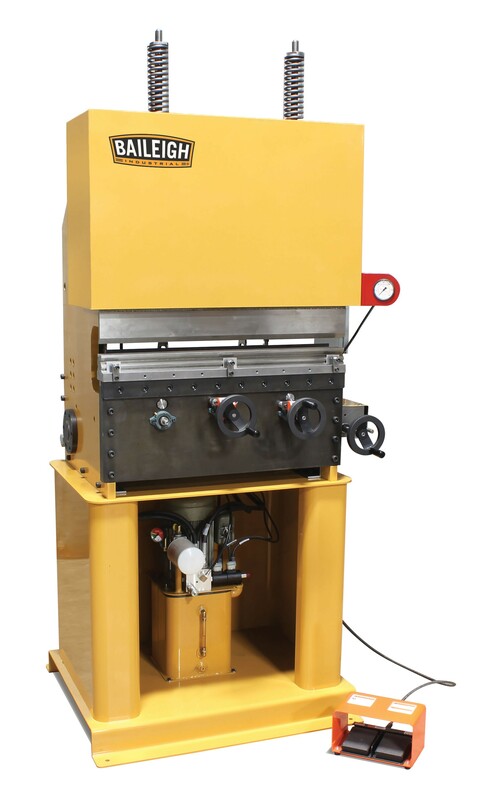 Model BP-5060NC, 50 Ton capacity, Max bending length 61", Max thickness .118", Throat depth 7.87", 49.21" Between housings, 11.81" From table to ram, Bending speed .275"/sec, Approach speed 3.14"/sec, Return speed 2.36"/sec, Adjustable stroke, 2 Axis NC controller, 3 Run modes: Jog/Manual/Auto, Foot pedal control, 1/2hp Motorized back gauge, Gauge length 23.62", DRO for downward stroke, DRO for back gauge, Safety guards with a 6 light safety curtain, Front material rests, 28gal Oil capacity, 5hp 220v 3ph, Shipping Dim. 74.80" x 51.18" x 86.61", Shipping weight 6,160 lbs. 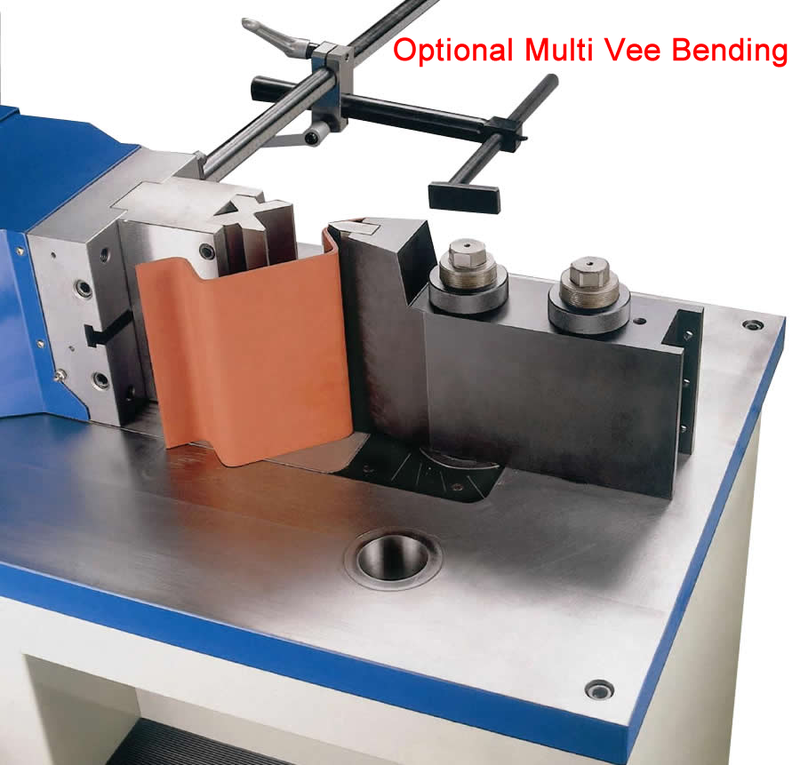 Model BP-6778NC, 67 Ton capacity, Max bending length 78.75", Max thickness .157", 6.29" Table width, 61" Between housings, 11.81" From table to ram, Stroke 5.9", Bending speed .275"/sec, Approach speed 3.14"/sec, Return speed 2.36"/sec, Adjustable stroke, 2 Axis NC controller, 3 Run modes: Jog/Manual/Auto, Foot pedal control, 1/2hp Motorized back gauge, Gauge length 23.62", Control on swing arm with DRO for downward stroke & DRO for back gauge, Safety guards with a 6 light safety curtain, Front material rests, 35gal Oil capacity, 7.5hp 220v 3ph, Shipping Dim. 90.55" x 61.02" x 94.48", Shipping weight 7,700 lbs. 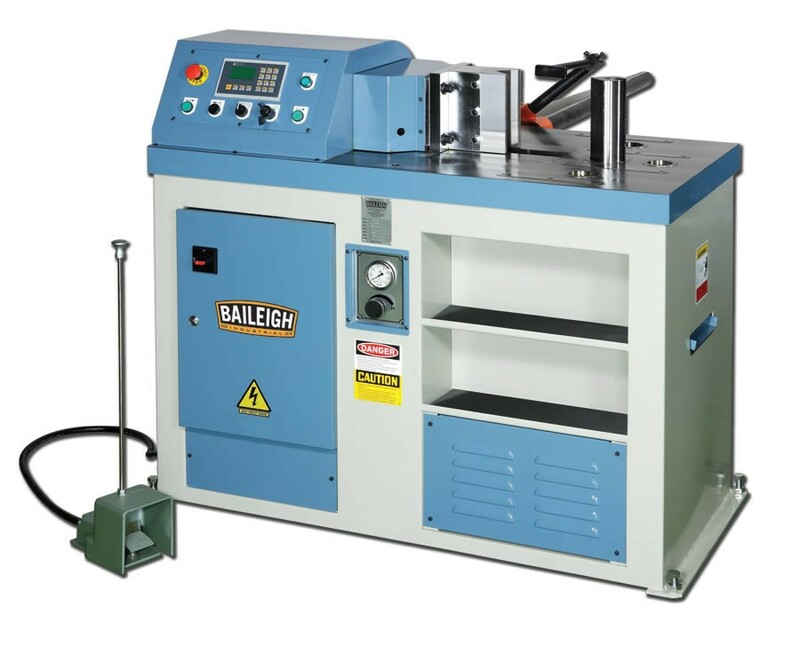 Model BP-9078NC, 90 Ton capacity, 6.29" Table width, 61" Between housings, 11.81" From table to ram, Stroke 5.9", Bending speed .236"/sec, Approach speed 3.14"/sec, Return speed 2.36"/sec, Adjustable stroke, 2 Axis NC controller, 3 Run modes: Jog/Manual/Auto, Foot pedal control, 1/2hp Motorized back gauge, Gauge length 23.62", Control on swing arm with DRO for downward stroke & DRO for back gauge, Safety guards with a 6 light safety curtain, Front material rests, 45gal Oil capacity, 10hp 220v 3ph, Shipping weight 8,800 lbs. 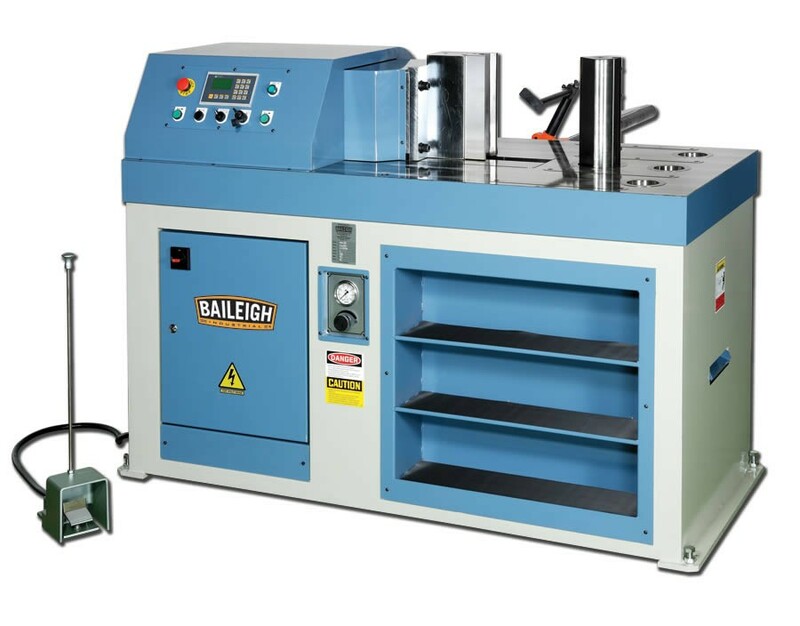 Model BP-12313NC, 123 Ton capacity, Bending capacity 157.5", Max thickness .098", Throat depth 9.84", 133.85" Between housings, 13.75" From table to ram, Bending speed .236"/sec, Approach speed 2"/sec, Return speed .236"/sec, Stroke 7.87", Adjustable stroke, Delem 2 Axis NC controller can hold 40 programs with 25 bends per program, 3 Run modes: Jog/Manual/Auto, Foot pedal control, 1/2hp Motorized back gauge, Gauge length 23.62", DRO for downward stroke, DRO for back gauge, Safety guards with Fiessler light safety curtain, Multi vee bottom die and gooseneck punches with quick change holders are standard, 15hp 220v 3ph, Shipping Dim. 175.2" x 70.87" x 102.36", Shipping weight 19,800 lbs. 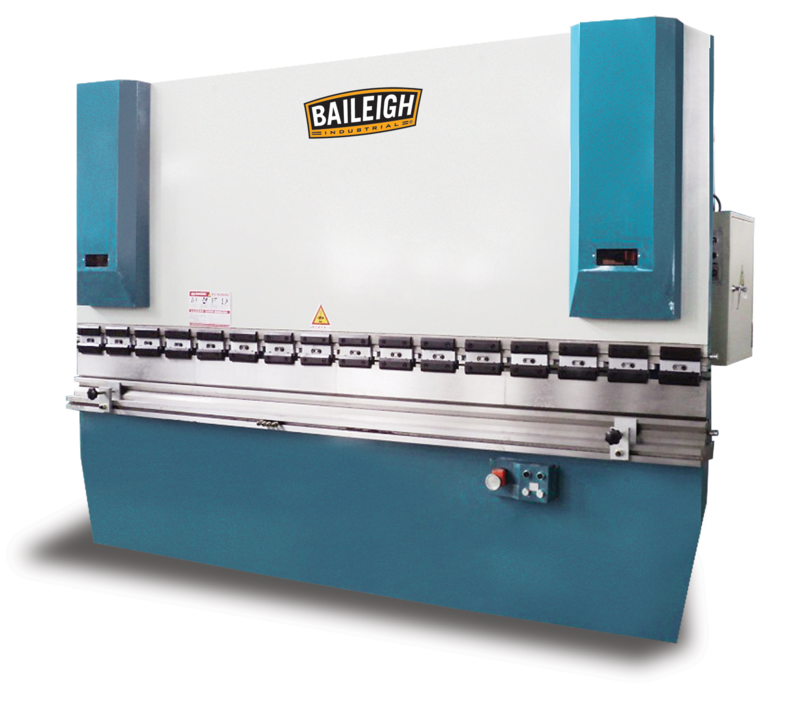 Hydraulic CNC Press Brake BP-7098CNC - 70 Ton x 98"
Model BP-7098CNC, 70 Ton capacity, Table length 98.4", Throat depth 9.8", 80" Between housings, 14" From table to ram, Bending speed .6"/sec, Approach speed 2"/sec, Return speed 2.36"/sec, Adjustable stroke, Accuracy +/- .01mm, Estun E200 2 Axis CNC controller can hold 100 programs with up to 25 bends per program, 3 Run modes: Jog/Manual/Auto, Foot pedal control, 1/2hp Motorized back gauge, Gauge length 23.62", DRO for downward stroke, DRO for back gauge, Safety guards with Fiessler light safety curtain, Multi vee bottom die and gooseneck punches with quick change holders are standard, 7hp 220v 3ph, Shipping Dim. 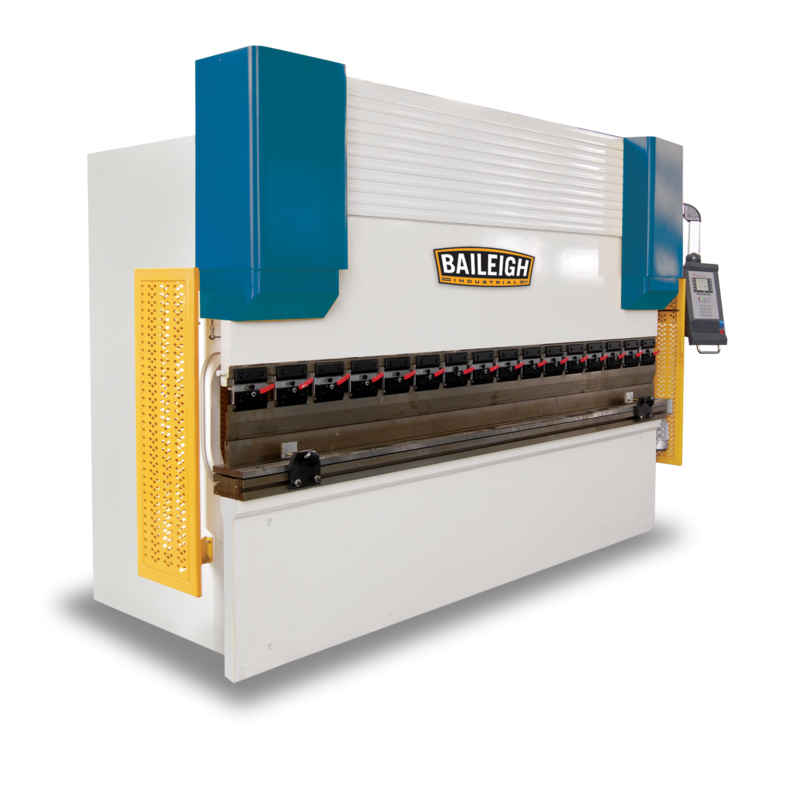 107" x 52" x 85", Shipping weight 9,251 lbs. 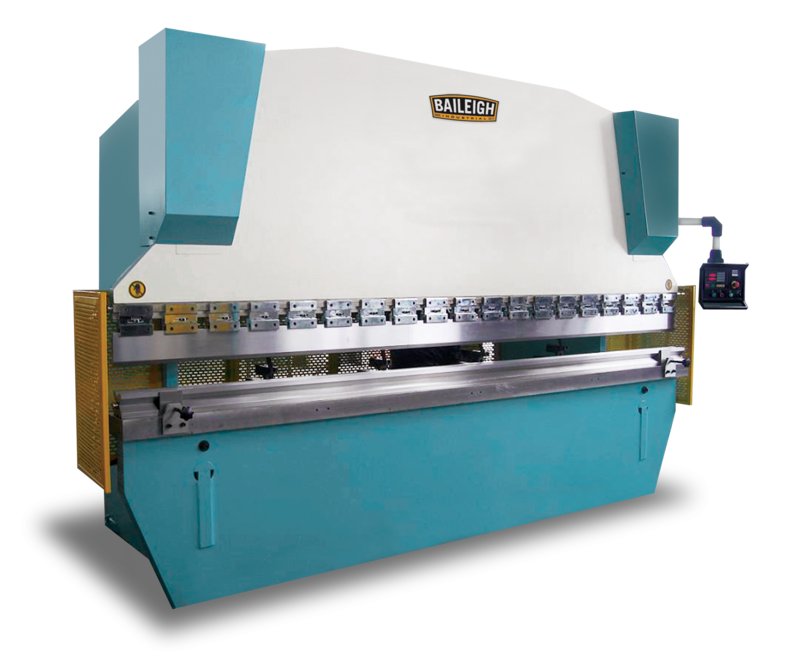 Hydraulic CNC Press Brake BP-9078CNC - 90 Ton x 78"
Model BP-9078CNC, 90 Ton capacity, Table Length 78", Bending capacity 78.75", Max thickness .196", Throat depth 7.87", 61" Between housings, 11.81" From table to ram, Bending speed .236"/sec, Approach speed 3.14"/sec, Return speed 2.36"/sec, 5.9" Stroke, Adjustable stroke, Accuracy +/- .01mm, Delem 2 Axis CNC controller can hold 40 programs with 25 bends per program, 3 Run modes: Jog/Manual/Auto, Foot pedal control, 1/2hp Motorized back gauge, Gauge length 23.62", DRO for downward stroke, DRO for back gauge, Safety guards with 6 sensor light safety curtain, This press brake is fully decked out making all options standard, Inside lighting, A set of multi vee tooling, Auto crowning compensation, Front support arms, 45gal Oil capacity, 220v 3ph, Shipping Dim. 94.50" x 63" x 94.50", Shipping weight 8,800 lbs. 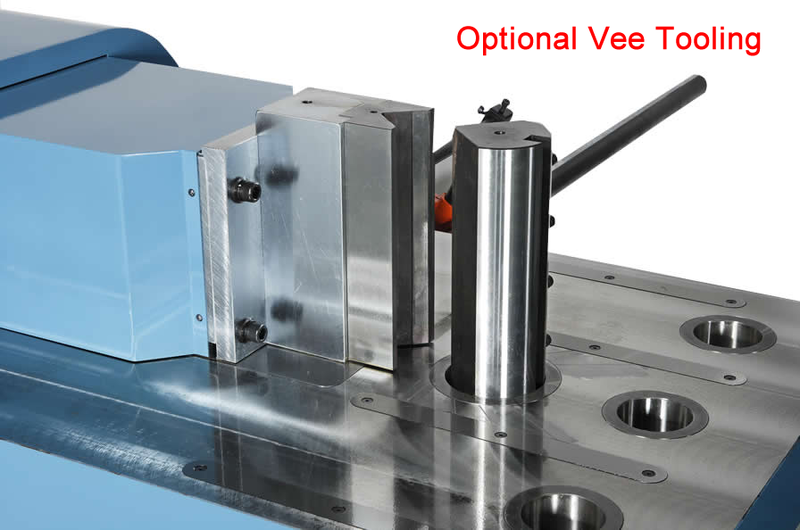 Model BP-11210CNC, 112 Ton capacity, Table length 125", Throat depth 12.5", 102" Between housings, 15.3" From table to ram, Bending speed .6"/sec, Approach speed 2"/sec, Return speed 2.36"/sec, Stroke 4.7", Adjustable stroke, Accuracy +/- .01mm, Estun E200 2 Axis CNC controller can hold 40 programs with 25 bends per program, 3 Run modes: Jog/Manual/Auto, Foot pedal control, 1/2hp Motorized back gauge, Gauge length 23.62", DRO for downward stroke, DRO for back gauge, Safety guards with Fiessler light safety curtain, Multi vee bottom die and gooseneck punches with quick change holders are standard, 10hp 220v 3ph, Shipping Dim. 134" x 52" x 95", Shipping weight 14,403 lbs. 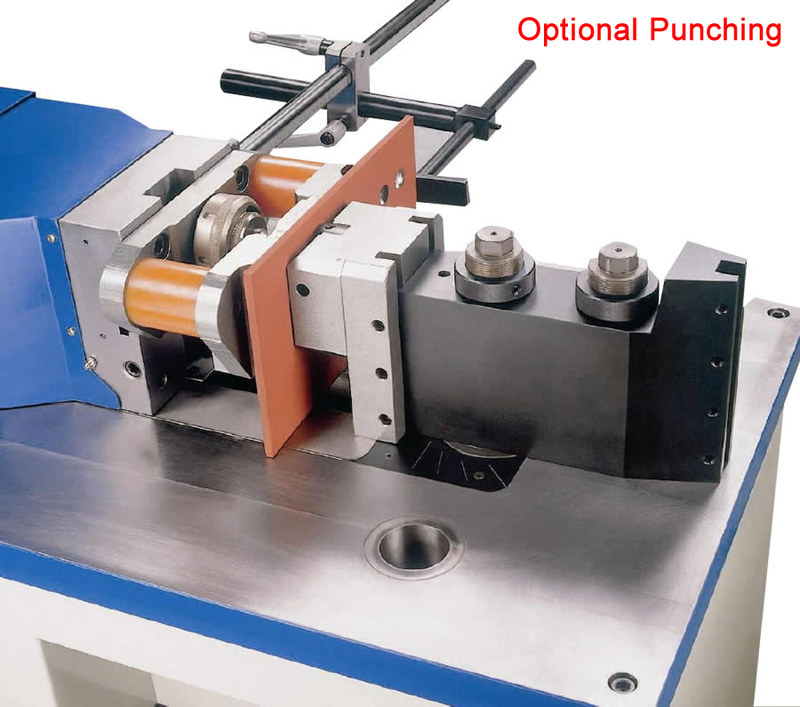 Model BP-14010CNC, 140 Ton capacity, Table length 125", Throat depth 12.5", 102" Between housings, 15.3" From table to ram, Bending speed .6"/sec, Approach speed 2"/sec, Return speed 2.36"/sec, Stroke 4.7", Adjustable stroke, Accuracy +/- .01mm, Estun E200 2 Axis CNC controller can hold 40 programs with 25 bends per program, 3 Run modes: Jog/Manual/Auto, Foot pedal control, 1/2hp Motorized back gauge, Gauge length 23.62", DRO for downward stroke, DRO for back gauge, Safety guards with Fiessler light safety curtain, Multi vee bottom die and gooseneck punches with quick change holders are standard, 10hp 220v 3ph, Shipping Dim. 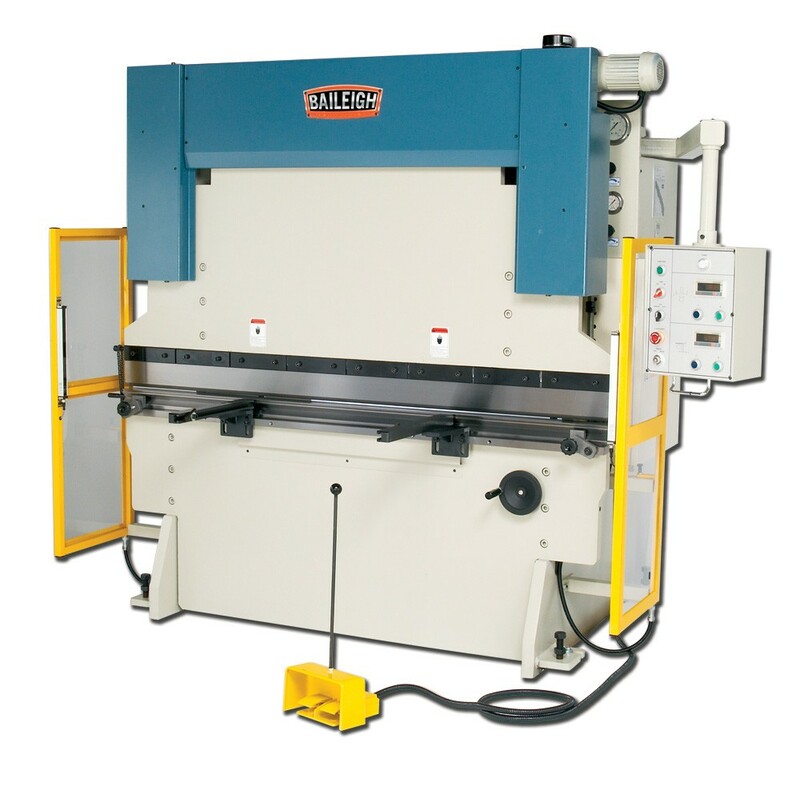 134" x 52" x 95", Shipping weight 14,600 lbs. 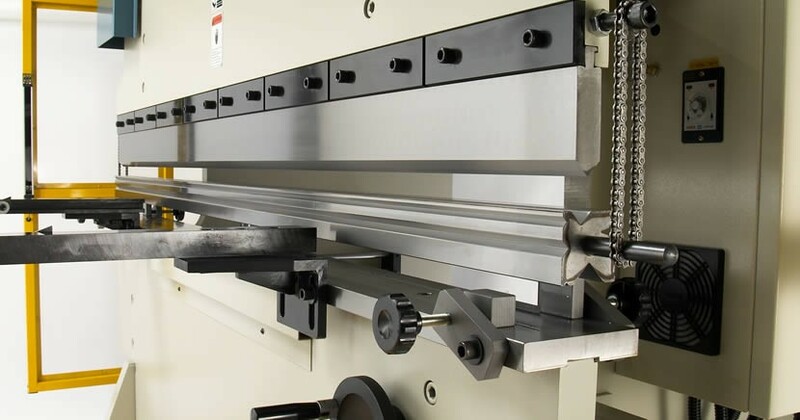 Model BP-14013CNC, 140 Ton capacity, Table length 157", Throat depth 12.5", 124" Between housings, 15.3" From table to ram, Bending speed .6"/sec, Approach speed 2"/sec, Return speed 2.36"/sec, Stroke 4.7", Adjustable stroke, Accuracy +/- .01mm, Estun E200 2 Axis CNC controller can hold 40 programs with 25 bends per program, 3 Run modes: Jog/Manual/Auto, Foot pedal control, 1/2hp Motorized back gauge, Gauge length 23.62", DRO for downward stroke, DRO for back gauge, Safety guards with Fiessler light safety curtain, Multi vee bottom die and gooseneck punches with quick change holders are standard, 10hp 220v 3ph, Shipping Dim. 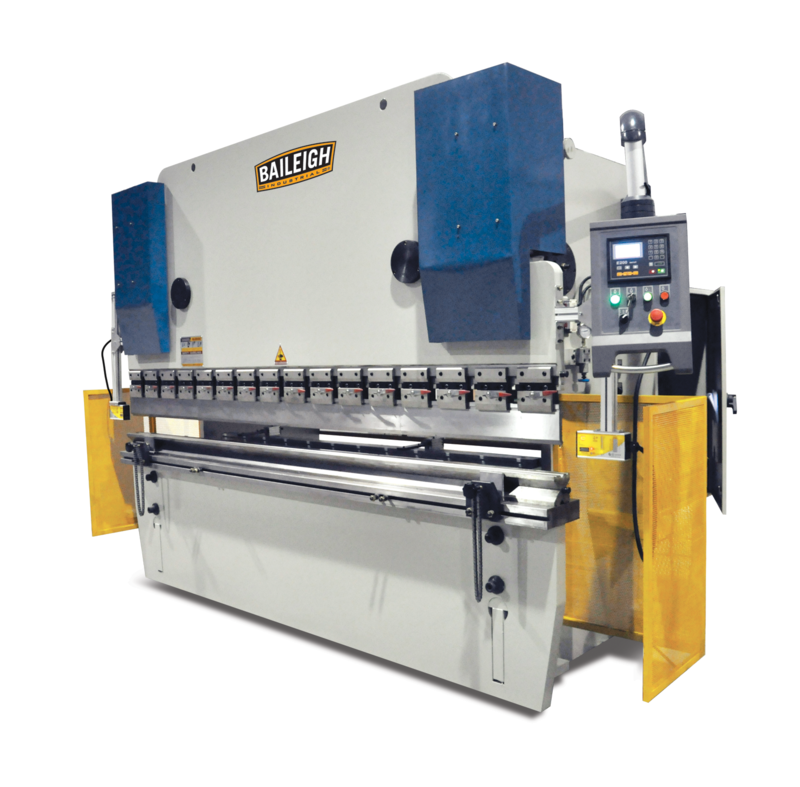 165" x 52" x 97", Shipping weight 17,700 lbs. 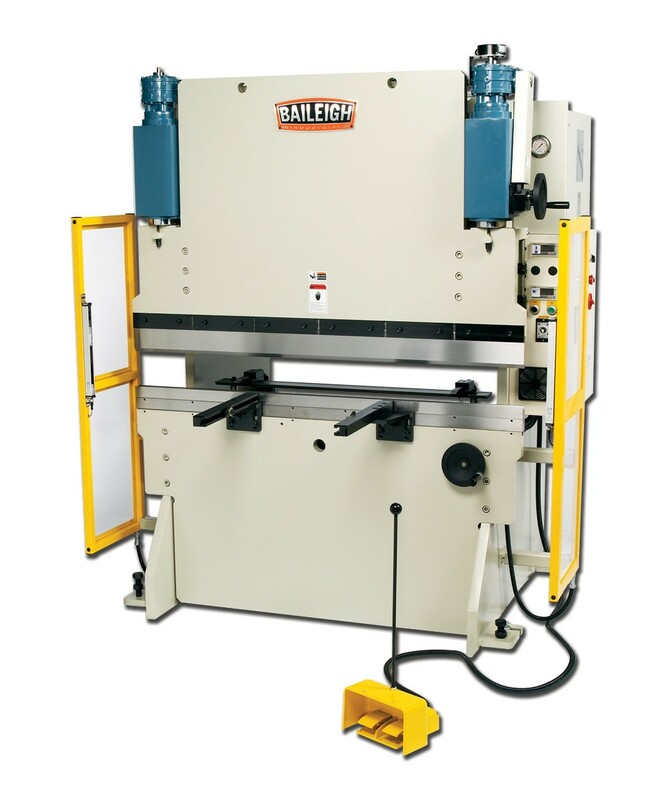 Model BP-17910CNC, 179 Ton capacity, Table length 125", Throat depth 12.5", 100" Between housings, 17.7" From table to ram, Bending speed .236"/sec, Approach speed 2"/sec, Stroke 7", Adjustable stroke, Accuracy +/- .01mm, Estun E200 2 Axis CNC controller can hold 40 programs with 25 bends per program, 3 Run modes: Jog/Manual/Auto, Foot pedal control, 1/2hp Motorized back gauge, Gauge length 23.62", DRO for downward stroke, DRO for back gauge, Safety guards with Fiessler light safety curtain, Multi vee bottom die and gooseneck punches with quick change holders are standard, 15hp 220v 3ph, Shipping Dim. 134" x 64" x 103", Shipping weight 21,280 lbs. 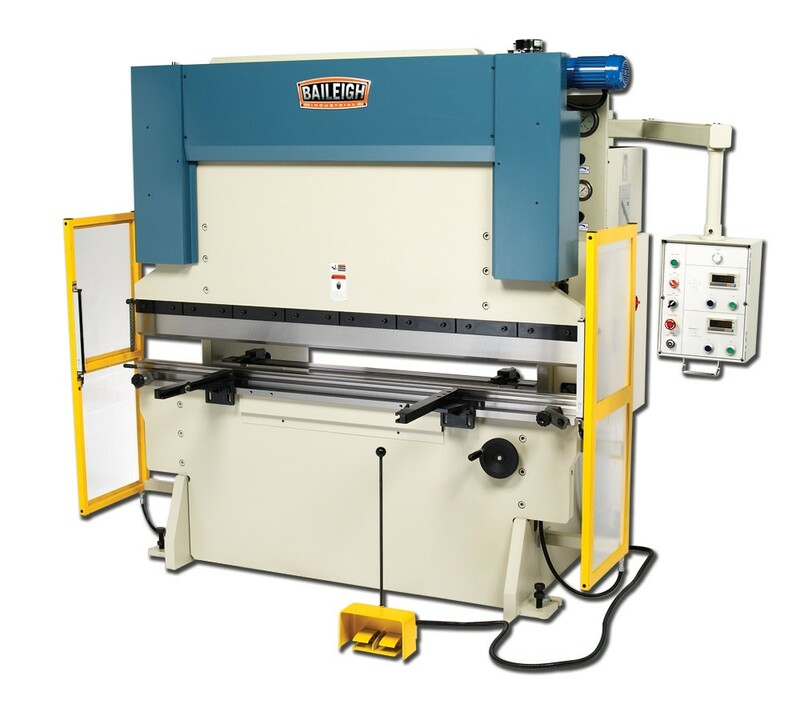 Model BP-17913CNC, 179 Ton capacity, Table length 157", Throat depth 12.5", 123" Between housings, 17.7" From table to ram, Bending speed .236"/sec, Approach speed 2"/sec, Stroke 7", Adjustable stroke, Accuracy +/- .01mm, Estun E200 2 Axis CNC controller can hold 40 programs with 25 bends per program, 3 Run modes: Jog/Manual/Auto, Foot pedal control, 1/2hp Motorized back gauge, Gauge length 23.62", DRO for downward stroke, DRO for back gauge, Safety guards with Fiessler light safety curtain, Multi vee bottom die and gooseneck punches with quick change holders are standard, 15hp 220v 3ph, Shipping Dim. 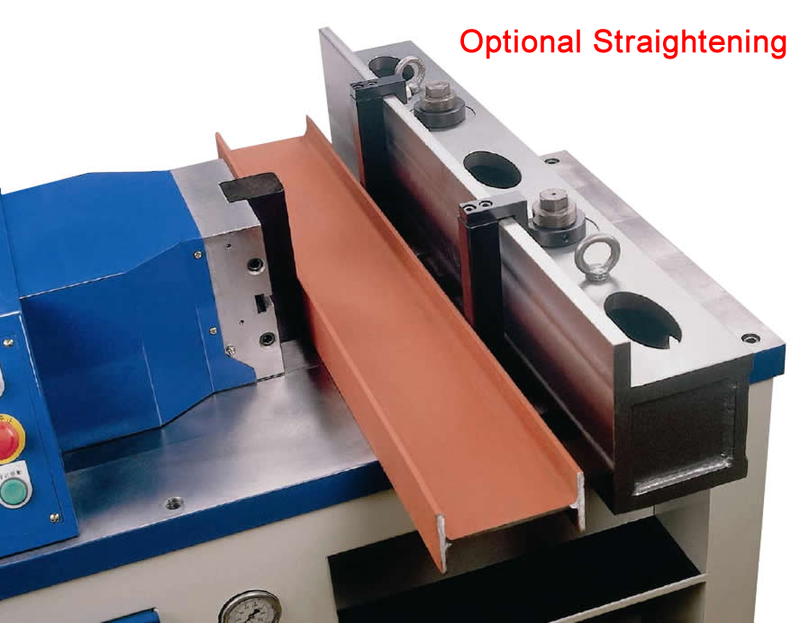 166" x 64" x 103", Shipping weight 24,640 lbs. 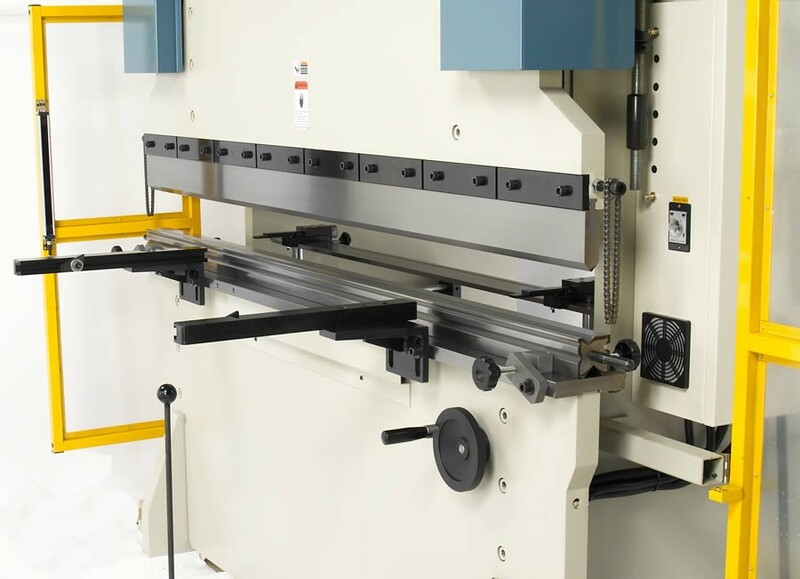 Model BP-22410CNC, 224 Ton capacity, Table length 125", Throat depth 12.5", 100" Between housings, 17.7" From table to ram, Bending speed .236"/sec, Approach speed 2"/sec, Stroke 7", Adjustable stroke, Accuracy +/- .01mm, Estun E200 2 Axis CNC controller can hold 40 programs with 25 bends per program, 3 Run modes: Jog/Manual/Auto, Foot pedal control, 1/2hp Motorized back gauge, Gauge length 23.62", DRO for downward stroke, DRO for back gauge, Safety guards with Fiessler light safety curtain, Multi vee bottom die and gooseneck punches with quick change holders are standard, 15hp 220v 3ph, Shipping Dim. 134" x 64" x 103", Shipping weight 21,280 lbs. 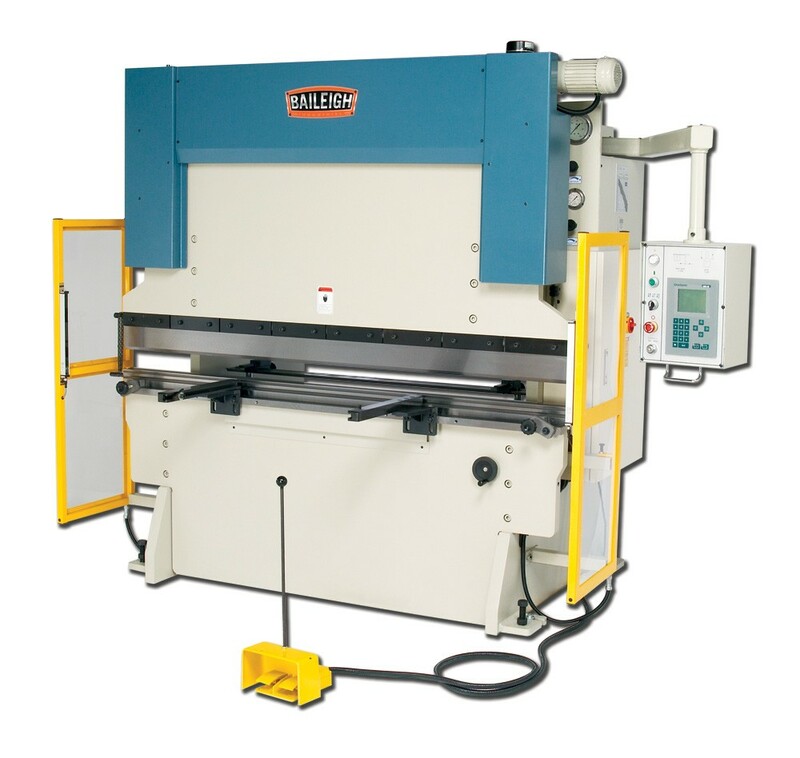 Model BP-22413CNC, 224 Ton capacity, Table length 157", Throat depth 12.5", 123" Between housings, 17.7" From table to ram, Bending speed .236"/sec, Approach speed 2"/sec, Stroke 7", Adjustable stroke, Accuracy +/- .01mm, Estun E200 2 Axis CNC controller can hold 40 programs with 25 bends per program, 3 Run modes: Jog/Manual/Auto, Foot pedal control, 1/2hp Motorized back gauge, Gauge length 23.62", DRO for downward stroke, DRO for back gauge, Safety guards with Fiessler light safety curtain, Multi vee bottom die and gooseneck punches with quick change holders are standard, 15hp 220v 3ph, Shipping Dim. 166" x 64" x 103", Shipping weight 24,640 lbs.